Celebrating Solar One Music‘s 40th release and 10th anniverary, this split LP sees two stars under various disguises, Heinrich Mueller (aka Der Zyklus and various other projects) and German producer Robert Witschakowski aka The Exaltics, back to back in a no return odyssey through the depths of the Galaxy. Expect nothing but contemplative and cosmic electro beats using original outer-space sounds from the Universe. Closing the Hubble telescope trilogy which brought to you Luxus Varta and more recently E.R.P. (respectively with the “Everything Is Nothing” and “Ancient Light” EP’s), trippy “Spiralgalaxie” will mark a new step in SOM‘s History. 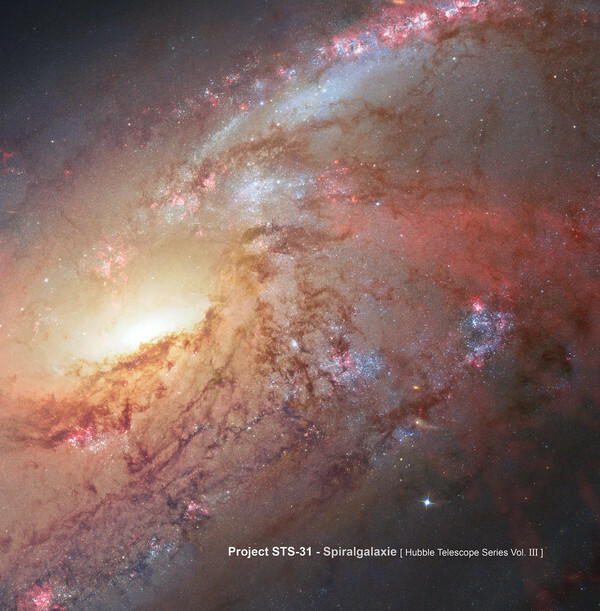 As usual, the final chapter of the series dedicated solely to Hubble and all the great scientists and engineers at the NASA and ESA, comes with a beautiful cover print picture taken by the Space Telescope.